When Christianity first leaked out of Palestine into the cities of the empire, it found its way not into architecturally beautiful temples but into tombs and places otherwise abandoned by respectable Romans. Holton Street, like ancient Rome, is marked by churches inhabiting structures abandoned by theaters, funeral homes, and retail businesses. These are not cathedrals of stained glass, pipe organs, and soaring steeples, but churches with hand-painted signs announcing weekly orders of worship and altars lovingly cobbled together from the found and affordable. These churches do not have a full-time clergy, but pastors with day jobs. To the east of Holton no such storefront churches can be found. The recycled buildings there are given over to yoga, Tai-Chi, massage, and peddlers of New Age crystals. But here, where the inner city merges with the affluent and trendy east, is an eruption of an old evangelical west that once populated the American landscape with revivals by the likes of Dwight Moody, Billy Graham, Aimee Semple MacPherson, and Charles Mason. These are the chapels of the disenfranchised, the oppressed, and the broken. Places where wounds are commanded to heal, and hope lays a gritty hold on urban life. This is no postmodern Joseph Campbellesque spirituality, but full throttled religion. Religion that is fire lapping at the edges of a civilization’s potential for decay. Religion that aspires for a time when tears are swallowed up by joy, and death holds no sway. Religion that fully expects the angels of heaven to descend and save. Such religion is alarming in its innocence and passion. It is a voice crying in the wilderness. A trumpet sounding in the distance with no retreat. On a Thursday night at the Iglesia Genesis the congregation whispers in invocation as the pastor prostrates himself at the altar. “Viva Dios.” “Sancte, Sancte, Sancte.” There are mostly teenagers and women. But at one point a middle-aged Latino man rises with his eyes closed to dance in the spirit. He circles and moves as the congregation sings along with the electric guitar and drums. In unpracticed English he explains to the only Anglo present that his life has been redeemed by his faith. He is no longer filled with suicidal despair. A beautiful young woman then declares, “We are called to be different in this place. 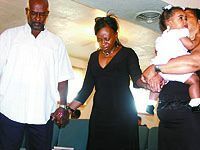 We are called to love.” Later that week the congregation holds an outdoor service on Buffum Street bearing witness to the presence of their God in a community riddled with crime. 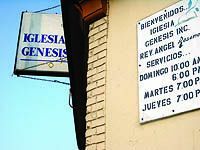 This Sunday is the 39-year anniversary of the presence of this congregation in Riverwest, and spirits are high in anticipation of a midday meal. 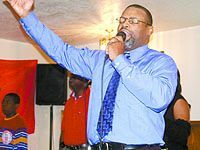 Pastor Carl Griffin preaches a sermon entitled “Let’s Get In An Uproar.” “You may not be wearing Ralph Lauren, or Abercrombie and Fitch,” he declares. “But if you can get jeans at Wal-Mart for $14.99, then God has provided for you.” “I can get ’em for $9.95,” responds an elderly woman. The congregation chuckles “Amen” in appreciation. “And you may not be eating filet mignon,” continues Pastor Griffin, “but if you’ve got wieners and buns then God has met your need.” Once again a response full of laughter and joy comes from the congregation, “And oh, those wieners are good!” Pastor Eugene Allen and 83-year-old elder Elizabeth Riley unlock the security gate at The Philipian Church of God in Christ for a Tuesday night Bible study. The church has been in Riverwest since 1974. Ms. Riley opens with prayer that the spirit might “move in this community.” In meditating on Psalm 38, “Taste and see that the Lord is good,” she explains, “My Jesus is sweeter than your momma’s pie.” Wednesday night is meeting night at the Christian Fellowship just north of the Holton Street viaduct. This particular Wednesday the pastor is out of town and his wife Yvonne occupies the pulpit. “Be not conformed to this world, but be transformed by the renewal of your minds,” she exhorts. This requires a change of mind set. “You are the sons and daughters of a king,” she says. “So when you go into work act with the dignity of princes and princesses.” She reminds the congregation that according to the Bible, faith as small as a mustard seed can move mountains, “And so it’s time that you started talking to your mountains and telling them to move.” Long before “spiritual” was used to describe matters of human faith, the term “ghostly” was common. The word captured a sense of a holy, invisible presence inhabiting an earthly form. Using a more contemporary and metaphorical understanding of ghostly, these Holton Street communities haunt the shells of businesses that have died and left for more attractive havens. 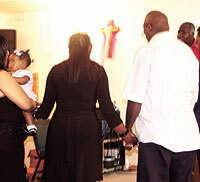 But in that ancient sense, these communities move with holy spirit. Sounding alarms. Unwilling to retreat. Staking boundaries against despair.